The Historic Core is a neighborhood in Downtown Los Angeles between Hill and Main streets on the west and east, and 3rd and 9th street on the north and south. It overlaps with the Jewelry District on its western end and Skid Row on its eastern end. It was the center of the city before World War II. With the general decline of downtown after World War II, and the movement of all financial institutions several blocks to the west, ending up on Figueroa Street, Flower Street, and Grand Avenue, the area suffered. In the 1950s it became the center of Latino entertainment in the city; the Million Dollar Theatre featured the biggest names in the Spanish language entertainment world. Which saw Broadway become a major center for Latino life in the city. Although prostitution and drug dealing had occurred in the area as far back as the early 1920s, they became epidemic in the 1960s. The area's movie palaces, built between 1911 and 1931, became grindhouses. The last of them closed in the 1990s; the Orpheum Theatre recently underwent a complete restoration at a cost of several million dollars, and is now used for major movie premieres (such as "Collateral" in 2005), celebrity events (Michael Jackson's birthday party), comedy shows (Kathy Griffin), fashion shows, concerts and plays. 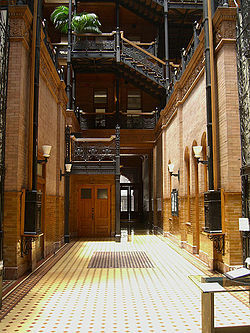 The iron-wrought interior of the Bradbury Building located on Broadway and 3rd St. In 1999, the Los Angeles City Council passed an Adaptive Re-Use Ordinance, allowing for the conversion of old, unused office buildings to apartments or "lofts." Developer Tom Gilmore purchased a series of century-old buildings and converted them into lofts near Main and Spring streets, a development now known as the "Old Bank District." Other notable redevelopment projects in the Historic Core have included the Higgins_Building, The Security Bank Building, the Pacific Electric Building, The Judson, and the Subway Terminal Building. As of 2005, redevelopment projects in downtown Los Angeles have been divided about evenly between rentals and condominiums; though projects near the Staples Center arena in the South Park neighborhood have been overwhelmingly dedicated to condominiums. The Current loft buildings located in the Historic Core District are the; Douglas Building Lofts, Eastern Columbia Lofts, El Dorado Lofts, Great Republic Building, Higgins Building Lofts, Pan American Lofts, Rowan Building Lofts & Shybary Grand.